The Coral Beach Hotel & Resort in Paphos, Cyprus, is situated on 500 meters of natural sandy beach with its own private harbor. The hotel offers bright rooms with a balcony or terrace.This property is 3 minutes walk from the beach. Among the leisure facilities are an indoor pool, spa and 2 outdoor pools, one with waterslides. Each room has satellite TV, air conditioning and tea/coffee facilities. 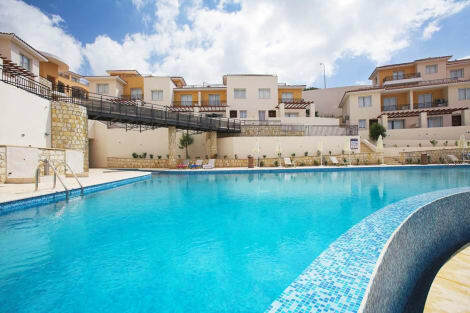 The complex has 4 bars and 6 restaurants serving Cypriot and international cuisine. Limani Taverna is by the beach and the hotel's private harbour and offers fresh fish, local specialities and traditional folk dancing. The Esthisis Spa treatments include massages, body wraps and facials. There are also a sauna, steam bath and hot tub. A gym and tennis courts are available and the supervised kids' club has interactive games, activities and movies. A crèche is provided for the youngest children. The key sights of Paphos, including the Byzantine Museum and Saranta Kolones Fortress, are 20 minutes away by car from Coral Beach Resort. Paphos International Airport is a 25-minute drive away. Grab a bite from the snack bar/deli serving guests of Club Coral View Resort. Enjoy a meal at the restaurant or snacks in the coffee shop/café. The aparthotel also offers room service (during limited hours). Relax with your favorite drink at the bar/lounge or the poolside bar. Buffet breakfasts are available daily from 7 AM to 11 AM for a fee. Grab a bite to eat at the Crown Restaurant, a restaurant where you can take in the garden view, or stay in and take advantage of room service (during limited hours). Unwind at the end of the day with a drink at the bar/lounge or the poolside bar. A complimentary buffet breakfast is served daily from 7 AM to 10 AM. Make yourself at home in one of the 144 air-conditioned rooms featuring kitchenettes. Rooms have private furnished balconies or patios. Flat-screen televisions with satellite programming provide entertainment, while complimentary wireless Internet access keeps you connected. Private bathrooms have deep soaking bathtubs and designer toiletries. Grab a bite at Artemis, one of the hotel's 2 restaurants, or stay in and take advantage of the room service (during limited hours). Unwind at the end of the day with a drink at the bar/lounge or the poolside bar. Pamper yourself with a visit to the spa, which offers body treatments and facials. You can take advantage of recreational amenities such as a health club, an outdoor pool, and an indoor pool. Additional amenities at this hotel include complimentary wireless Internet access, concierge services, and gift shops/newsstands. Make yourself at home in one of the 149 air-conditioned rooms featuring kitchenettes. Your room comes with a pillowtop bed, and all rooms are furnished with sofa beds. Rooms have private balconies. Conveniences include phones, as well as desks and refrigerators. lastminute.com has a fantastic range of hotels in Peyia, with everything from cheap hotels to luxurious five star accommodation available. We like to live up to our last minute name so remember you can book any one of our excellent Peyia hotels up until midnight and stay the same night.